Visible Ink Press : Which heroic figure was an inspiration for Bob Kane's creation of Batman? Which heroic figure was an inspiration for Bob Kane's creation of Batman? His weapon of choice is a sword, with which he likes to carve his initial. His alter ego is a Spanish nobleman living in Los Angeles. Antonio Banderas played him in a 2005 movie. His name is Spanish for "Fox." In Batman: Year One (1987), writer Frank Miller reveals that on the night that Batman's parents were killed, they had taken their young son Bruce to see the film The Mark of Zorro. The implication is that Bruce Wayne modeled his Batman identity after his childhood hero, Zorro. Indeed, Batman's co-creator Bob Kane acknowledged Zorro as an influence on the creation of his character. Although Zorro really belongs to the swashbuckler genre, he is clearly a precursor of the modern superhero and worthy of discussion as an archetype influencer. Zorro, whose name is Spanish for "The Fox," was created by writer Johnston McCulley in the serialized five-part story "The Curse of Capistrano," first published in the pulp magazine All-Story Weekly, beginning with Vol. 100 #2, on August 6, 1919. Zorro's true identity is Don Diego Vega (whose name was later changed to Don Diego de la Vega), a young nobleman who lived in Los Angeles, California, during the early nineteenth century when it was still under Spanish rule. Don Diego became the swordsman Zorro in order to defend the people of Los Angeles from political oppression. In 1920, the first great action star in the movies, Douglas Fairbanks, Sr., starred in a film adaptation of McCulley's story, titled The Mark of Zorro, which became a tremendous hit and an enduring classic. It was this film which established Zorro's iconic black costume, with the cape, gaucho hat, and mask concealing the top half of his face. As a result of the film's success, McCulley wrote over sixty more Zorro stories, starting in 1922; the last was published in 1959, a year after McCulley's death. Like another forebear of the superhero, the Scarlet Pimpernel, Zorro (in the McCulley and Fairbanks versions) pretends in his secret identity as Don Diego to be a useless, indolent fop, foreshadowing the public personas of Clark Kent and Bruce Wayne. Like Batman, Zorro has an animal motif: the fox. Also like Batman, Zorro has a subterranean headquarters and a loyal servant. Fairbanks displays extraordinary athletic ability as Zorro, like later superheroes such as Batman and Daredevil. Just as Batman uses his bat insignia as a symbol, Zorro famously uses the letter Z as his "mark," using his sword to carving it into the clothes--or sometimes the bodies--of his adversaries. Zorro is a master swordsman, known for his prowess at dueling. He is also a supreme horseman, usually shown riding a black steed. 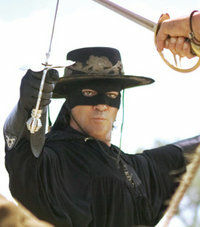 Zorro has been a continual presence in American popular culture, in many different media, ever since his debut in 1919. Fairbanks returned to the role in a movie sequel, Don Q, Son of Zorro (1925). Among his most famous film appearances is the 1940 remake of The Mark of Zorro, starring Tyrone Power in the title role. In The Mask of Zorro (1998), Anthony Hopkins played the original Zorro, who trained Antonio Banderas's character to be his successor; Banderas returned in the title role of The Legend of Zorro, in 2005. Zorro's most celebrated television appearances were in Walt Disney's Zorro series, that ran from 1957 to 1959, and starred Guy Williams in the title role. The great cartoonist Alex Toth drew Zorro stories for Dell Comics in the 1950s and 1960s, based on the Disney version. More recently, writer Don McGregor has done Zorro stories for a newspaper comic strip, and for comic books for Topps, Dark Horse, and Papercutz. McGregor also co-created Zorro's costumed female ally, Lady Rawhide. Dynamite Entertainment launched a new Zorro comic book series in 2008. Other superheroes who were evidently inspired by Zorro include DC's The Whip (who debuted in Flash Comics #1, January 1940) and El Diablo (from All-Star Western #2, October 1970), and Marvel's El Aguila (from Power Man and Iron Fist #58, August 1979). V in Alan Moore's V for Vendetta also owes a debt to Zorro, complete with using a letter of the alphabet as his symbol. The Hanna-Barbera studio memorably parodied Zorro by giving its animated character, Quick Draw McGraw, his costumed identity as El Kabong, who hits evildoers with his guitar.